History was created on last Friday (16 March, 2018). Grand finale of Bangladesh’s first ever English Olympiad was held at International Convention City Bashundhara (ICCB). English is one of the most prominent languages of the world that has its impact in almost every field of work. To be a global citizen, having fluency in English is absolutely quintessential. With the motto of “Inspiring Leadership” English Olympiad had embarked on an epoch-making journey to recognize and cherish students with outstanding qualities, to create future leaders and to inspire countless more. The gala event was organised by the Daily Sun and Worldwide Organisation and Charity (WOC). Last year, approximately 5 million people were reached to spread the necessity of learning English and to lead the world for a better tomorrow. There were about 1000 campus ambassadors in 8 divisions of Bangladesh. About 35,000 participants registered for the event. Many of them participated at divisional selection rounds in 2017. A highly dedicated campus ambassadors’ team was ever active with the leadership of 8 divisional coordinators. “We organized many workshops and conferences for the interested participants and young entrepreneurs to show them the right way of learning English and to be a competent global citizen. We have a unique URL in Twitter, Instagram, LinkedIn, YouTube as well as a very responsive Facebook fan page to have interactive conversations with participants and guardians. English Olympiad is the biggest platform of its kind consisting of all kinds of students, institutions, participants and young leaders with diversified age groups,” said Mohammad Aman Ullah, Chief Organizer, English Olympiad. In the meantime the Daily Sun, which has powered the event, has been publishing necessary materials, news and articles related to the competition with pictures for the past ten months. The feedback was huge with all the young participants expressing much enthusiasm over the event. There were mainly six groups. Group ‘Kids’ was for children below class 2 while ‘Juniors’ had children from class 3 to class 5. The groups ‘Small Starts’ and ‘High Flyers’ included students from classes 6 to 8 and 9 to 10 respectively. Those from classes 11 and 12 were called ‘Trail Blazers’. ‘Seniors’ had participants studying above HSC. English Olympiad worked to organize 65 “District Level Selection Rounds and International Workshop on Communication Skills”. There were 3 rounds in this competition named Selection Round, Theater Round and Grand Finale. Another important guest Dr Atiur Rahman, former Bangladesh Bank governor, said, “People of Bangladesh need to acquire good command of English to compete with rest of the world and enable the country to achieve its development targets.” He added that with the final round of the English Olympiad taking place, the future of Bangladesh is being defined as all these young participants are leaders of tomorrow. Shiabur Rahman, Executive Editor of the Daily Sun, said, “Although many students of Bangladesh are good at writing English, most of them are weak in speaking the language.” He put emphasis on the importance of English language and called upon the young generation to be serious about English proficiency. Only 800 of 35,000 participants were short-listed for the final round. From each group, top 10 were selected. One by one, sixty participants went to the stage and received their awards from the organizers and guests. Out of top 60, top 18 were selected. They were Maliha Farzana (Dhaka), Suhania Anan Haque (Sylhet) and Tanjim Ahbab (Sylhet) from group Kids. From ‘Small Starts’, Tahmid Nishan Harun (Sylhet),Sadman Mirsab Shopnil (Rangpur) and Irin Baksh (Sylhet) were selected. Fatin Hamama (Dhaka), Sadaf Yousuf Chowdhury (Chittagong) and Mahira Salma Chowdhury (Sylhet) were selected from the group ‘Juniors’. ‘High Flyers’ had Heea Zaman (Dinajpur), Md Zim Mim Siddiquee (Dhaka) and Sultana Razia (Dhaka) soaring high. ‘Trailblazer’ had Abid Khan, Sadman Sakib and Faiyaz Sakif Khan from Dhaka. In the group of Seniors, the selected participants were Pushpa Paul Chowdhury (Sylhet), Mirza Iffat Noor ( Rajshahi) and Fahad Alam Etu (Chittagong). Champions from six groups are Maliha Farzana from ‘Kids Group’, Tahmid Rashid from ‘Small Stars’, Fatin Hamama from ‘Juniors’, Hiya Zaman form ‘High Flyers’, Abid Khan from ‘Trailblazers’ and Puspa Pal Chowdhury from ‘Seniors’. Top three of each group had to show their excellence at the stage performance to be champions and runners-up of the six groups each. They were presented with crests and prize money. Winners got Tk. 25,000, Tk. 15,000 and Tk. 10,000 respectively for being champion, first and second runner-up. 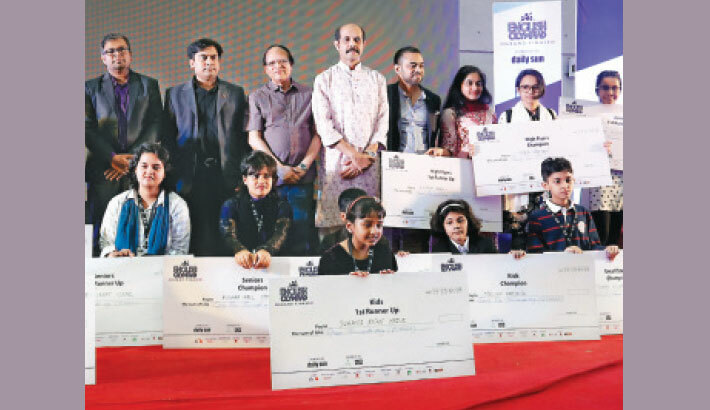 Atiur Rahman, Shiabur Rahman and Atiqul Islam handed over the prizes among the winners. English Olympiad Grand Finale was truly a special evening. The attendees have left the premises carrying invaluable lesson and priceless memories with them. Most students who could not win this year are now waiting eagerly for next year’s English Olympiad. Keep your eyes on the Daily Sun and Worldwide Organisation and Charity (WOC) for updates of the event.